Synthetic Small Flat Top 872 ($12.95): I had been using my Real Techniques Contour brush for blending concealer under my eyes but I got this because I wanted a smaller brush that would give me more control. I love (looove) this brush! It gives my concealer an airbrushed finish. It’s quite dense so I use it with a light hand. It blends cream and liquid concealers very well. It’s also good for spot concealing and contouring the nose. 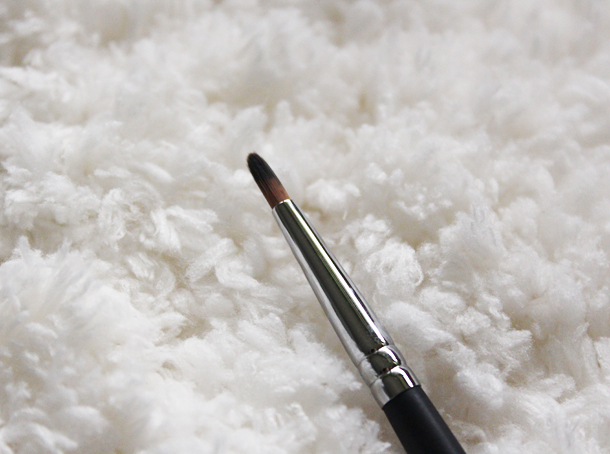 Pencil Brush 904 ($8.95): I had been looking for a small pencil-type brush for my crease. I have small hooded eyes so I find that most brushes are too big for detailed crease work. This brush met all my expectations. It’s really soft and gives me a lot of control over eyeshadow placement. It’s very soft and great for smudging eyeshadow in the lashline too. 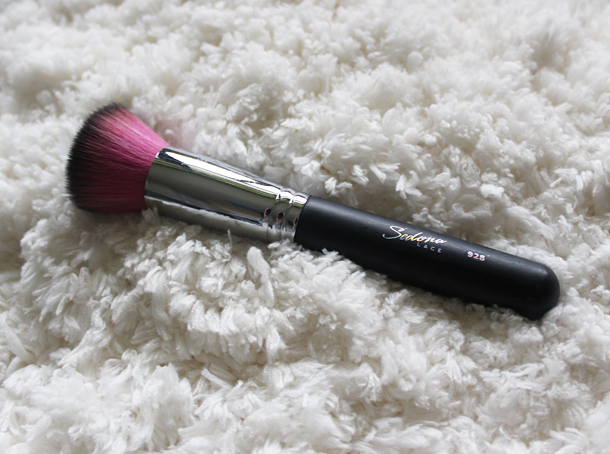 Dome Contour FB 05 ($12.95): This brush has the perfect shape for number of different uses: blush, contour, highlighter, powder. It’s not as soft as the FB03 or the 928. The difference in softness is noticeable but it’s not by any means scratchy or low-quality. 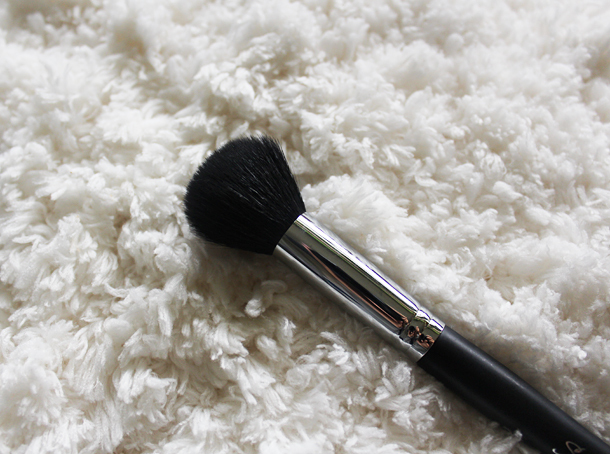 I like to apply face powder and sheer blushes with this brush. I find it too small and dense for pigmented blushes. I also love it for highlighter. 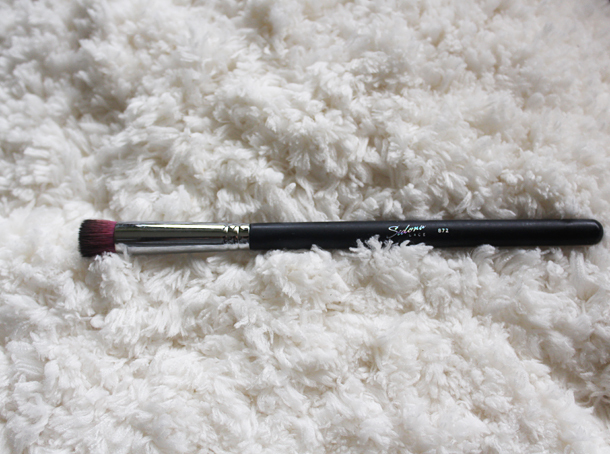 Tulip Contour FB 03 ($14.95): I wanted a tulip-shaped brush for the longest time! It’s labeled for contouring but I use it for applying loose setting powders because it’s tapered but not super dense. It gives me a controlled, non-cakey application. 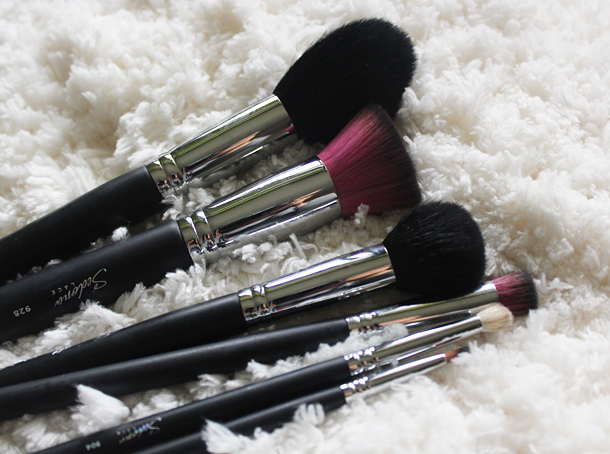 It’s bristles are softer than the FB 05’s but not as soft as the pink one’s (the flat top). Eyeliner Brush 772: I like that this brush has the right amount of stiffness to allow a precise gel liner application. 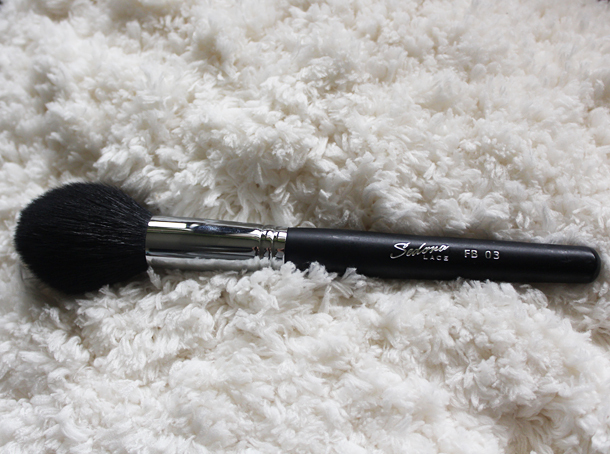 It holds up well against long lasting liners and constant washing. However, it’s a bit thicker than I imagined it would be. I’m used to thinner eyeliner brushes so this one doesn’t seem as precise. Synthetic Flat Top 928 ($14.95): I was unsure which synthetic foundation to get from their Midnight Lace collection (the pink and black brushes). Somehow I settled for the flat top but I think I want them all. This is a wonderful buffing brush, if you like buffing brushes chances are you’ll love this one too. The bristles are so soft. I placed two separate orders from Sedona Lace. I had a very very good shopping experience with them. Both times my ordered was shipped within 24 hours of being placed. The shipping rates are very affordable. I paid only $2 for shipping the first time and $4 the second time. I’m sure there are free shipping codes around the net but I decided to use the 20% discount instead. They do 20% off somewhat regularly. I also got sent some mini eyeshadow pans as free samples. All in all, I have nothing but good things to say about Sedona Lace. I’ve been using the brushes a ton (hence why they’re dirty). As expected, the synthetic pink brushes are the softest but the ones with the black bristles are nice too. The only “meh” brush in the bunch is the eyeliner brush because it’s too big for my taste. Let me know if you’ve also tried Sedona Lace brushes. What were your experiences? I too have heard of sedona lace for a very long time on youtube. I have always wanted to try them even before the sigma hype. Great review. I love the brushes you chose. I've not heard much about this brand before but the tulip contour has caught my eye! I need a good brush set, I've always wanted the Sigma Ms Bunny collection I wonder if Sedona's are more affordable? They sound lovely, I love the colour of them too. I'll be trying them out, I'm sure! I eventually need to get my hands on these brushes. I bought two the Sedona Lace midnight lace brush set during black friday last year and they were on sale for 50% off. I love them all and I was ecstatic to get 2 awesome set for merely $60. They are fantastic and their prices are much nicer than Sigma. I've noticed that Sigma increased the price of their brushes so I'm not even tempted to get anything from them anymore. I guess I can join the crowd because out of all the brushes, the "tulip" brush caught my eye. This will be picked up sometime in November. What a great post Coco! I absolutely LOVE Real Techniques brushes, but I've never tried Sedona Lace! You're right though, they are so hyped up on youtube. i might have to make an order! I haven't had a chance to try out Sedona lace brushes, but I'm seriously considering them because of this review. However, I (probably unnecessarily) fear longevity may be an issue with brushes like these. I had a fantastic Sephora eyeshadow brush that just gave up on me; the ferrule started coming loose! Nonetheless, these look like they deserve a good look, especially the 872! Aah I have been hearing about the Sedona Lace Brushes everywhere!! So jealous that you got to try them out…they all look super nice! I'm really interested in that Dome Contour Brush! Looks divine! I love it when the brushes are soft. 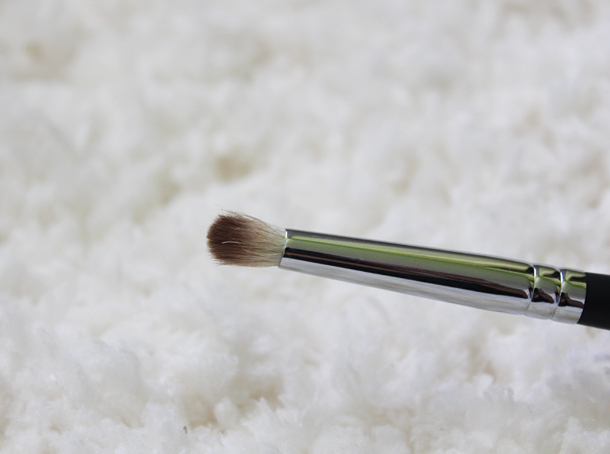 I found the Real Techniques foundation brush to be too rough on my skin. Thank you for the detailed reviews!!! I have been wanting to try these brushes but never get around to ordering! Hopefully they will have some kind of sale soon so I can order a few! I have heard they are similar to sigma..